Seeking EXTREME SKIN CONDITIONS for life changing show! 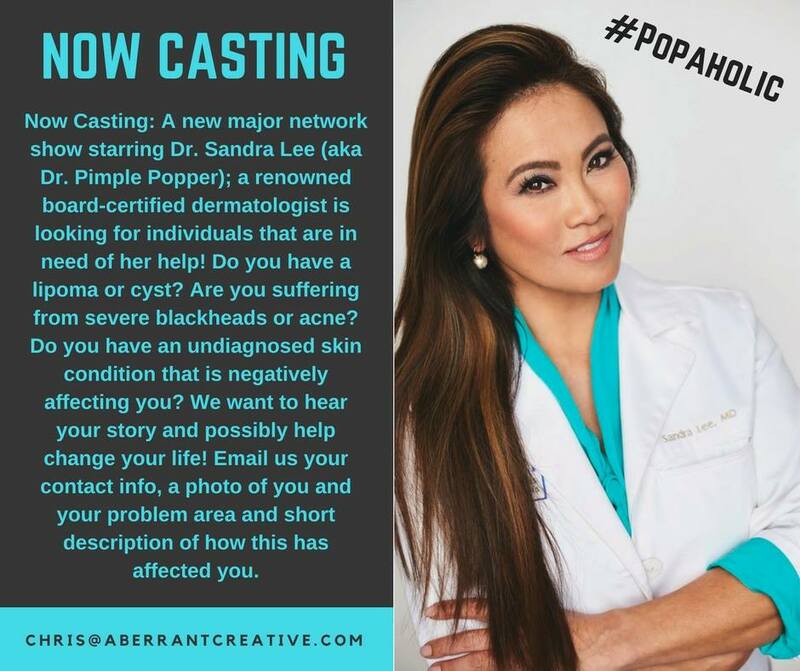 A new major network show starring Dr. Sandra Lee (aka Dr. Pimple Popper); a renowned board-certified dermatologist is looking for individuals that are in need of her help! Do you have a lipoma or cyst? Are you suffering from severe blackheads or acne? *If selected, all travel and medical costs are paid for. Hi! my name is Saul I am 16yrs old & have white heads all over my face I am currently using your acne product it helps out on my other break outs (pimples) but not on my white heads I desperately need help this has affected me with my self esteem especially because my father is the only provider for my house there’s no money for them to take me or buy me expensive treatments please help desperately in need. I will send you my dads information. I have moles and skin tags all over my face. I would really love your help in clearing these off my skin. I have great skin but seems age is trying to take its toll; i am not having! LOL. Please help. Thank you for opening this forum. Please email me, do not write here, thanks! I have a lot of scars on my legs, the reason why I am to afraid to wear skirt, swimsuit and shorts for almost a decade. If you can help me, that would really change my life a lot. I am a 57 year old female with Papulopustular rosacea. I also have lipomas on my wrist and legs. I’m a bit addicted to the pimple popper. I suffer from a major skin condition that Drs are baffled by. Or just looks at me strange. I so desperately need help. I’d love to have clear skin.